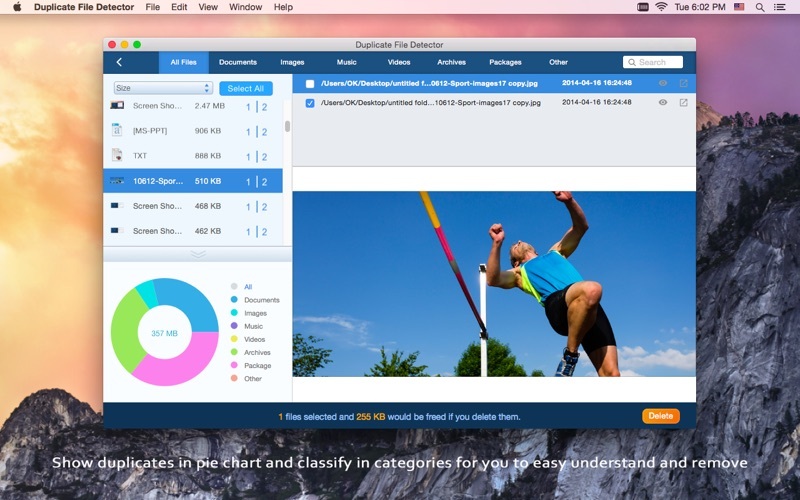 **** Get it to find and delete the duplicates, clean your mac hard drive quickly. Annoyed with the unnecessary duplicates on your Mac? 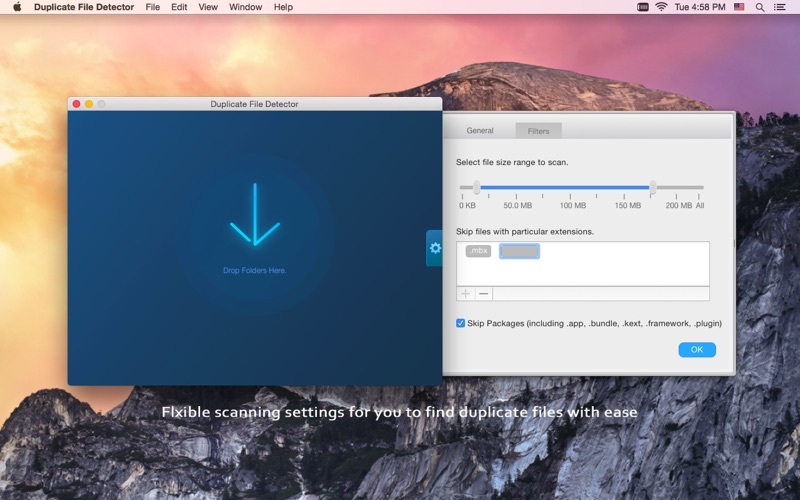 Duplicate File Detector will help you find all kinds of duplicate files including iTunes and iPhoto duplicates on your Mac, and remove the found identical files to free up precious space on your hard drive within a minute. - Find and remove all kinds of duplicates files such as photos, music, videos, documents, spreadsheets and other personal files. 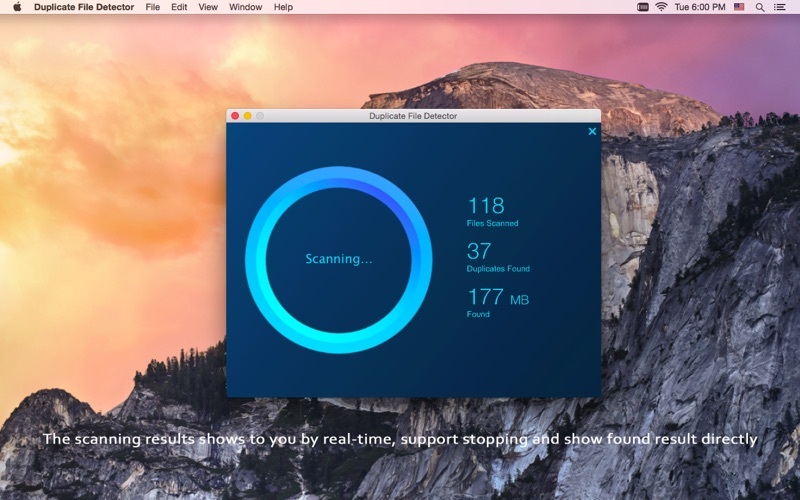 - Detect and delete the duplicate files on the whole disk. - Scanning and detecting all true duplicate files by comparing all the file content byte by byte within minutes. - You also could just scan and find the duplicate files by search duplicate file name. - Find and remove the duplicate photos in iPhoto Albums. - Find and remove the duplicate music files in iTunes. - Works well to find duplicates on external drives and SD cards. - Support to specify the scanning conditions before find the duplicates: find by contents or find by file name. 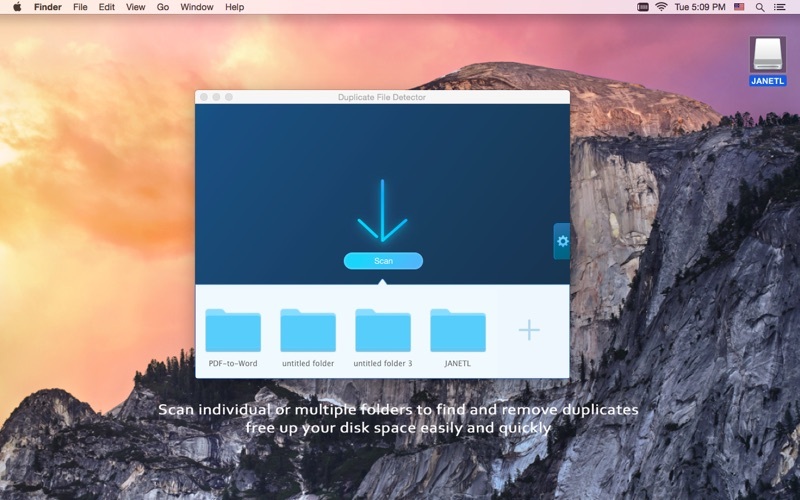 - Scan individual or multiple folders in one go. 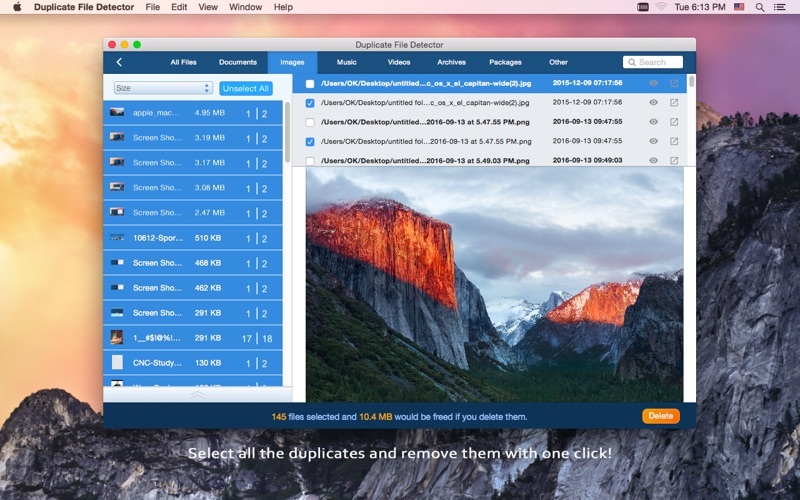 - Search for duplicates files with customized size filter. - Could skip files with particular extensions. - Enable to skip packages. - No duplicates missed out with accurate scanning algorithms - MD5 value checksum algorithm. - Automatically generate a straightaway report with a pie chart for the scanning result. - Sort files by name, size, file, or file count. - Hide useful files in case of removing them by accident. - Enable to select duplicate files with keyboard shortcuts. - Click the search button to open the original file in finder. - Intuitive interface leads you to quickly erase duplicates. - Specifying filters makes scanning simple. - Delete duplicates in batches at a click. Thanks for all the customers supporting, we have completed upgrading this Duplicate File Finder to new version for better finding and deleting duplicates on Mac. Please kindly leave an updated review. We will read every comment and keep continuous to improve the app. If you have a suggestion, please message us at sales@enolsoft.com. 1. Support finding duplicates by file name. 2. Support stopping at any time when scanning. 3. Show and classify duplicate files overview or in tab view. 4. Set to sort duplicate files by name, size, file, or file count. 5. Support finding and removing duplicates from apps, including iPhoto and iTunes. 6. One-click to select/deselect of all duplicates at ease. 7. Move duplicates to Trash, erase them completely, or move to selected folder. 8. Preview the duplicate files with Quick Look.